The Prime Minister, Theresa May, surprised many when she announced her intention to call a UK general election to be held this Thursday, 8 June 2017. The ‘snap’ election came as a shock not least because, as she acknowledged in her announcement, since becoming Prime Minister she had made it clear that she did not anticipate any election before the next scheduled general election in 2020. A combination of Westminster ‘game playing’, which might weaken her government’s hand in Brexit preparations and negotiations, and the fact that talks would otherwise reach a critical stage in the run up to the next scheduled election, led Mrs May to conclude that it was in the national interest to hold an election after all and by so doing remove possible uncertainty or instability with regard to the country’s future. So the electorate is being asked to provide Mrs May and her Conservative government with a direct mandate to settle the terms of Britain’s exit from the European Union, leaving it “free to chart its own way in the world” (regaining control of our money, laws, and borders with the opportunity to strike our own trade deals). Surely few can have missed the campaign mantra ‘strong and stable leadership’ versus a ‘coalition of chaos’ (Labour propped up by the Liberal Democrats and Scottish Nationalist Parties). 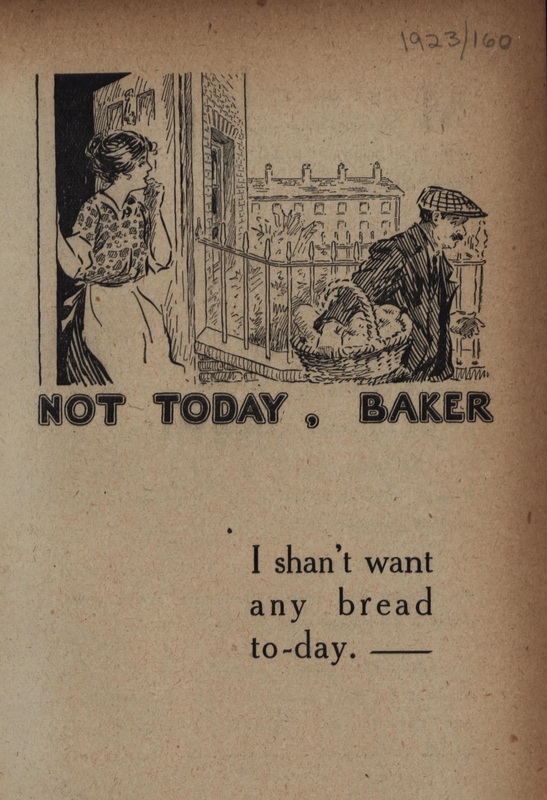 So, as we look forward to the results of this week’s ‘snap’ general election it might be interesting to look back to a previous ‘snap’ election, specifically the general election called by Stanley Baldwin in 1923. 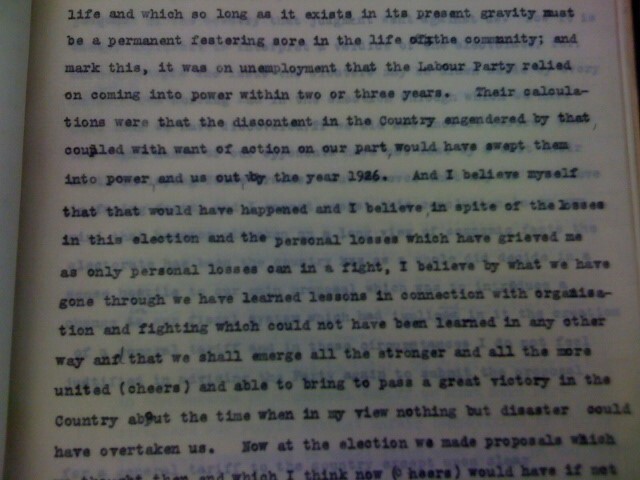 The 1923 general election no doubt also came as a surprise to many both inside and outside Westminster. The previous year had seen the end to Liberal-Conservative coalition government with a return to power by the Conservative Party with a large majority. 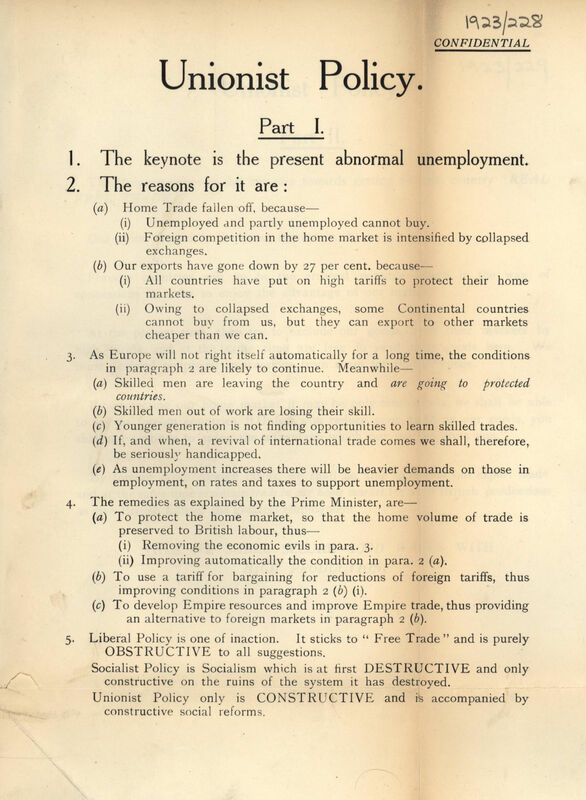 Thus, when the Conservative leader, Bonar Law, resigned in May 1923 due to poor health and Baldwin inherited his premiership, the Party might have enjoyed four more uninterrupted years in power. 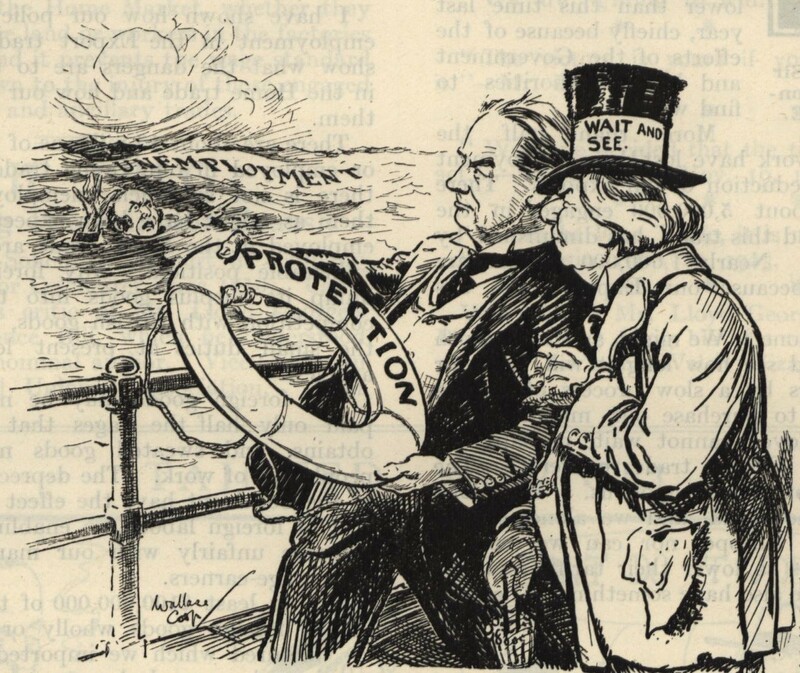 Baldwin decided to call a general election that same year on the divisive issue of tariff reform (which had failed to win popular support in 1906 [PUB 212/3/1]) as the solution to increasing unemployment and worsening economic conditions. This policy contradicted assurances given by his predecessor that such a fiscal change would not be made by the government. Perhaps it was because Baldwin had concluded (wholly or in part) that protectionism as opposed to free trade was the way forward for the nation that he sought a direct mandate from the electorate. 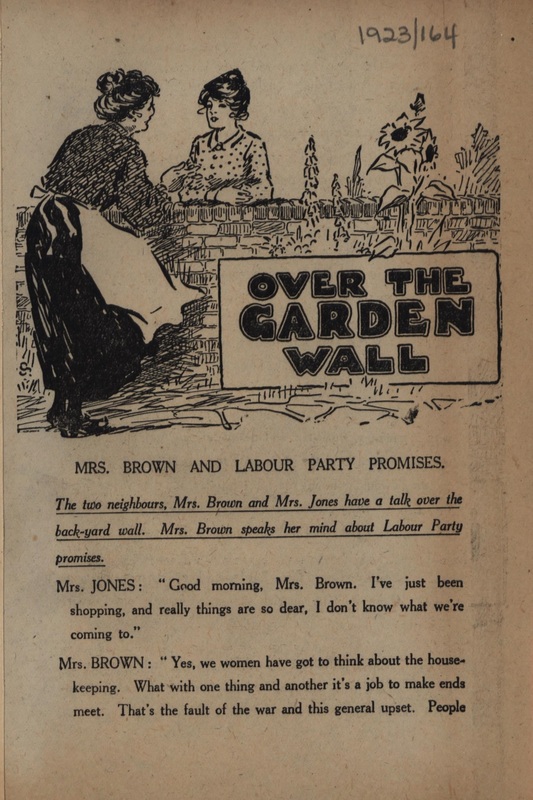 The holdings of the Conservative Party Archive include many Party campaign leaflets produced in the run up to the general election with such slogans as ‘British labour in danger’ [PUB 39/1:1923/13], ‘Protect the Home Market’ [PUB 39/1:1923/126, ‘Protection means a Full Purse’ [PUB 39/1: 1923/152], ‘Protection Means a Chance for the Boys’ [PUB 39/1:1923/154], and ‘Protection means the Big Market Basket’ [PUB 39/1:1923/156]. 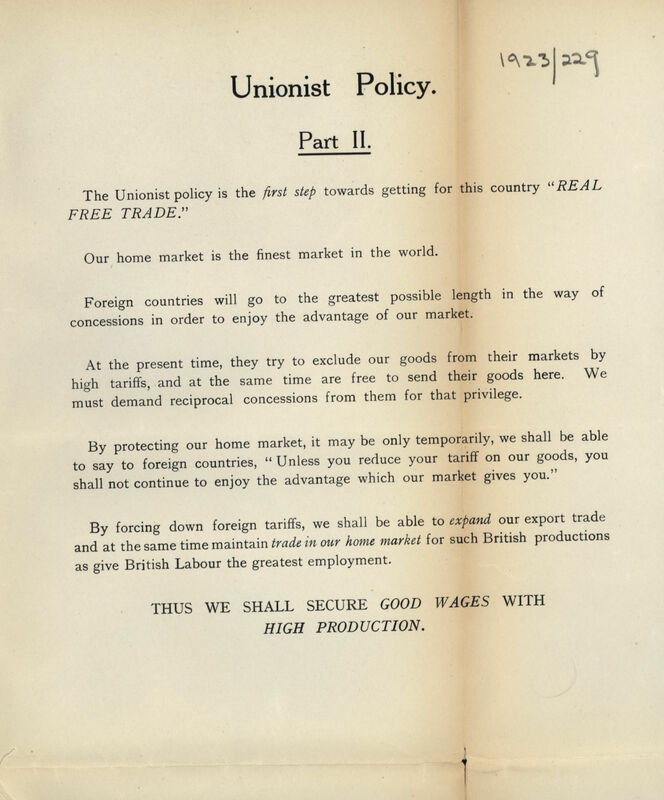 [England] allows foreign goods to come into the country free of all tax, so that we find work for the foreigner instead of giving our own labour preference. 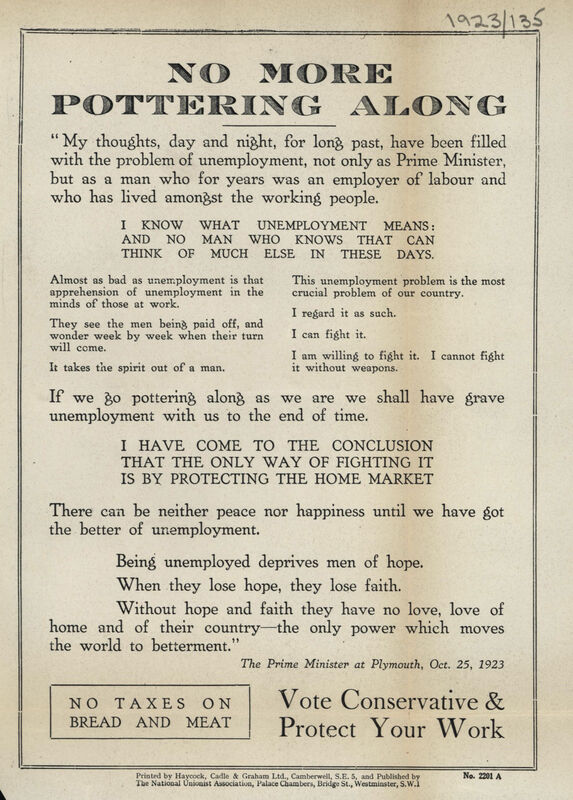 An important element of the campaign was the obvious determination to appeal to the working classes who had been hit hard with unemployment. 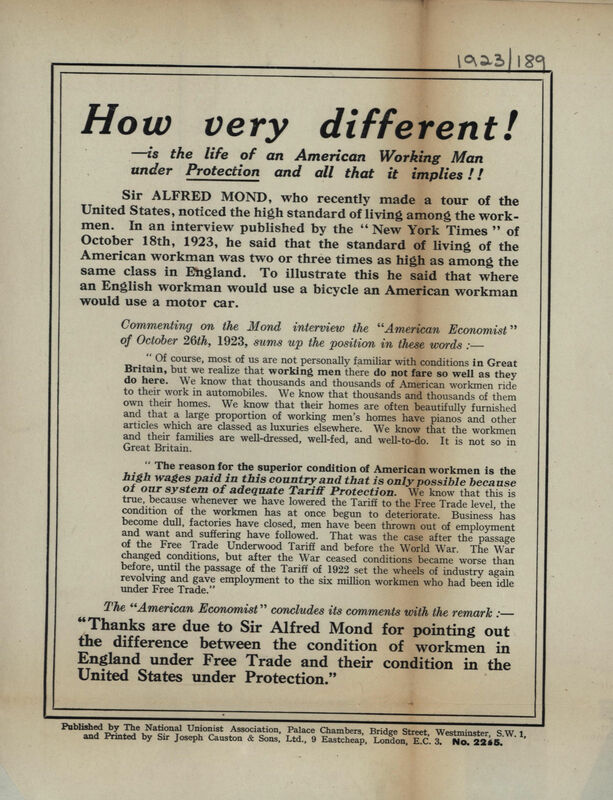 Little wonder then that skilled British workers were said to be leaving for countries like the USA which afforded them greater employment opportunities through protectionism [see for example, PUB 39/1:1923/138]. 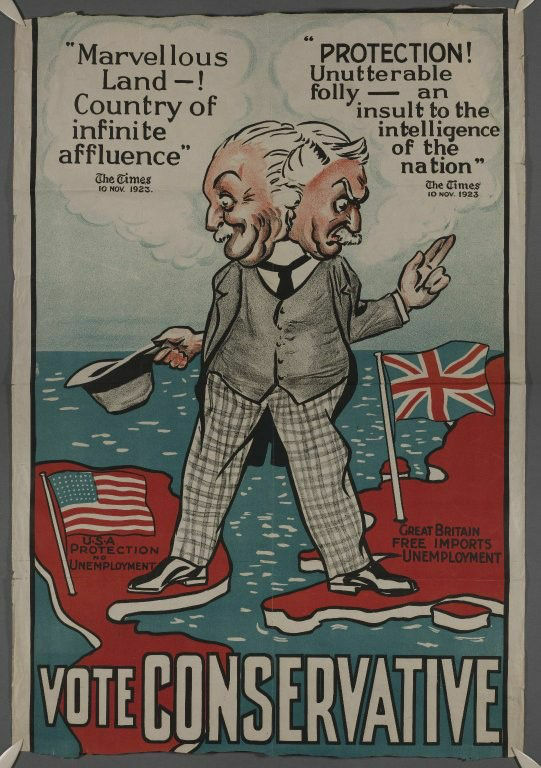 So-called ‘brain drain’ is clearly not a new thing by any stretch. 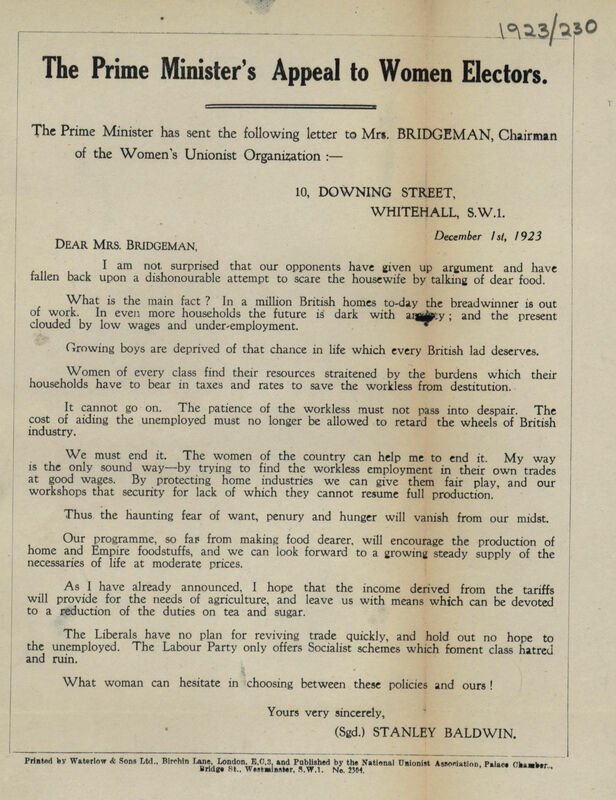 The Party campaign appealed not only to male workers but also to women who had attained the right to vote only a few years before in 1918 (although not yet on equal playing field with their male counterparts which came in 1928 when the age restriction was reduced to 21 in line with men). 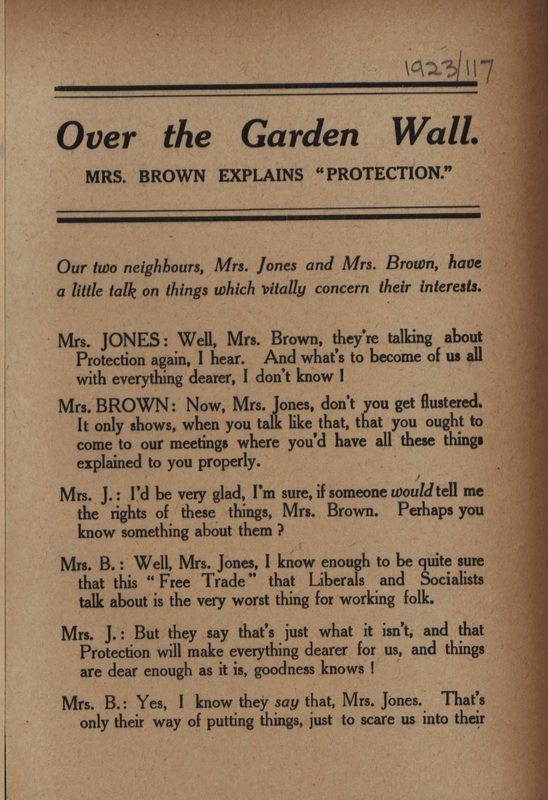 There were also the ‘Over the Garden Wall’ series of leaflets in which a Mrs Brown explains the Conservative Party’s position to her rather less politically informed neighbour, Mrs Jones. 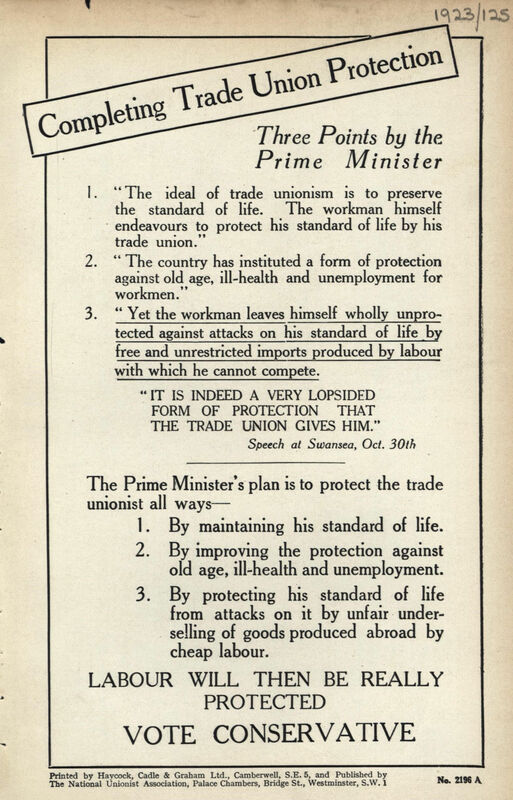 She variously explains and extols the virtues of ‘Protection’ and ‘Imperial Preference’ and offers an analysis of the Labour Party position, Conservative plans for social reform by ‘getting things done for the workers’, what a socialist government would mean for Britain should they win the election – contrasting the action of the Conservatives to the ‘talk’ of the Labour Party, and why the Socialists want free trade in preference to protection. 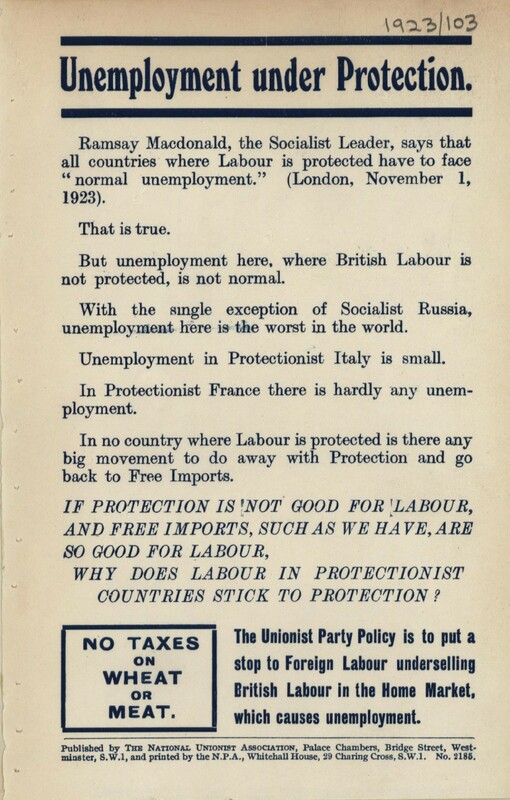 As part of the campaign to win support from working men the Party also highlighted their common ground with the Unions. 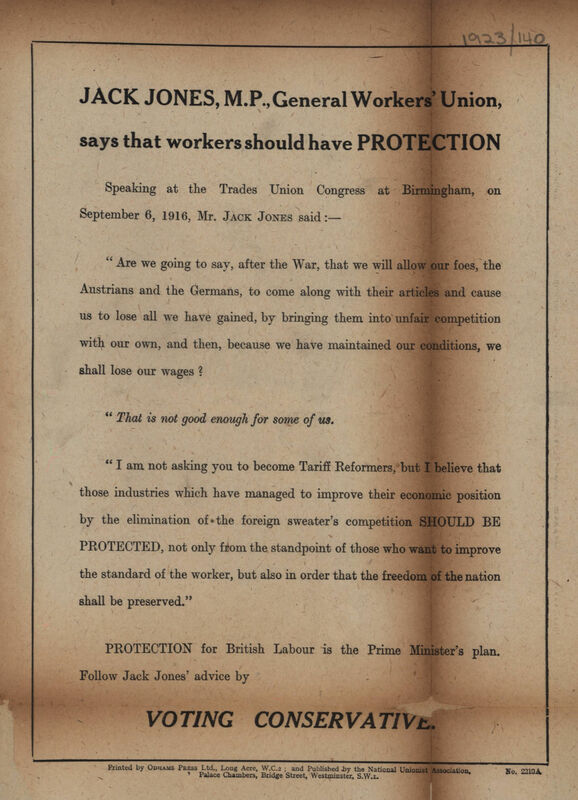 At the Birmingham Trades Union Congress of 1916 a resolution was passed that “methods should be adopted which will restrict or prevent importation of cheap manufactured goods”, and it was argued that it was the Conservatives who sought to protect British labour in this way [PUB 39/1:192/159]. 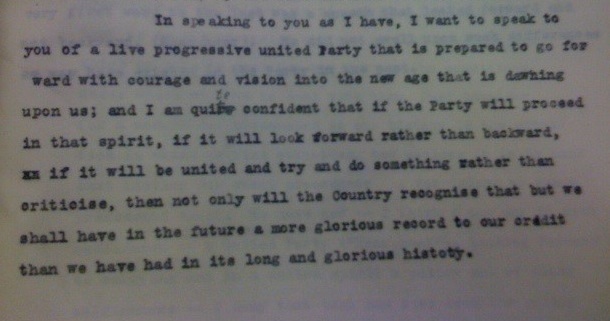 Baldwin’s decision to call his ‘snap’ election in 1923 proved ultimately to be a gamble he and his Party failed to win. Although the Conservatives remained the largest party, they dropped from 344 MPs to 258, and the result was a hung Parliament. 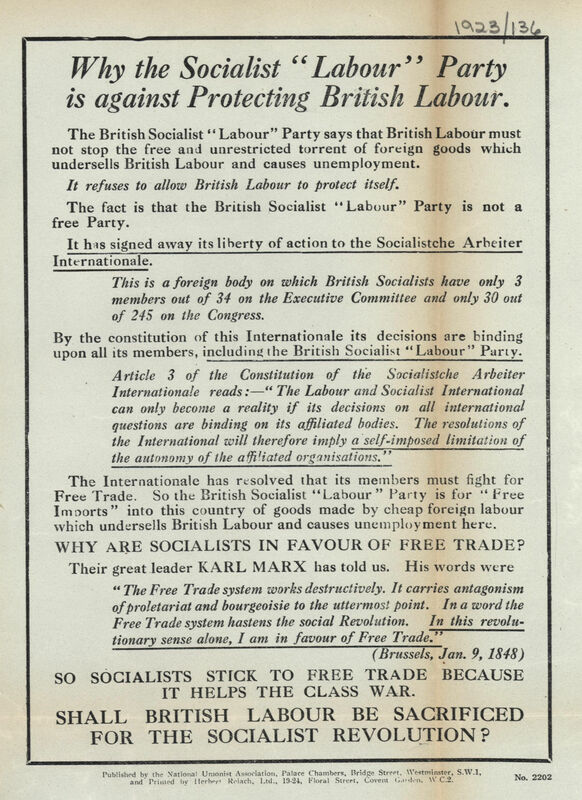 Instead, perhaps because neither the Conservatives nor the Liberals relished the prospect of another coalition government, it was the Labour Party which formed the next minority government, albeit with only 191 MPs in the Commons. 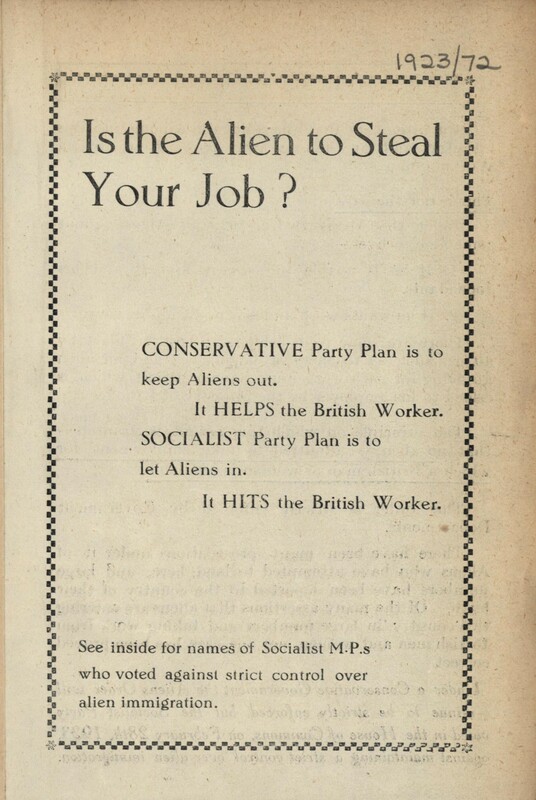 Although short-lived, this represented a seismic shift in British politics: not only was this the first time that Labour had ever held power, but the 1923 General Election also saw Labour eclipse the Liberals as the second largest party, something from which the Liberals were never to recover. 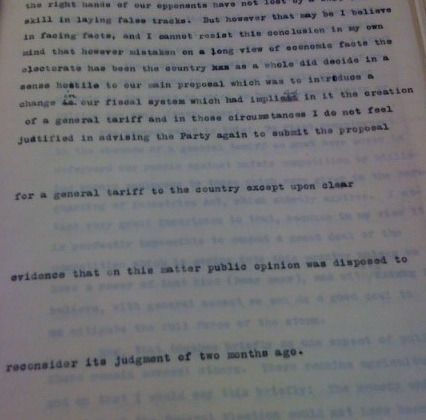 In his own post-election analysis at the Hotel Cecil in London on 11 February 1924 [PUB 207/1], Baldwin acknowledged that Tariff Reform ought to be shelved “except upon clear evidence that on this matter public opinion was disposed to reconsider its judgement” [p. 5]. I want to speak of a live progressive united Party that is prepared to go forward with courage and vision into the new age that is dawning upon us […]. 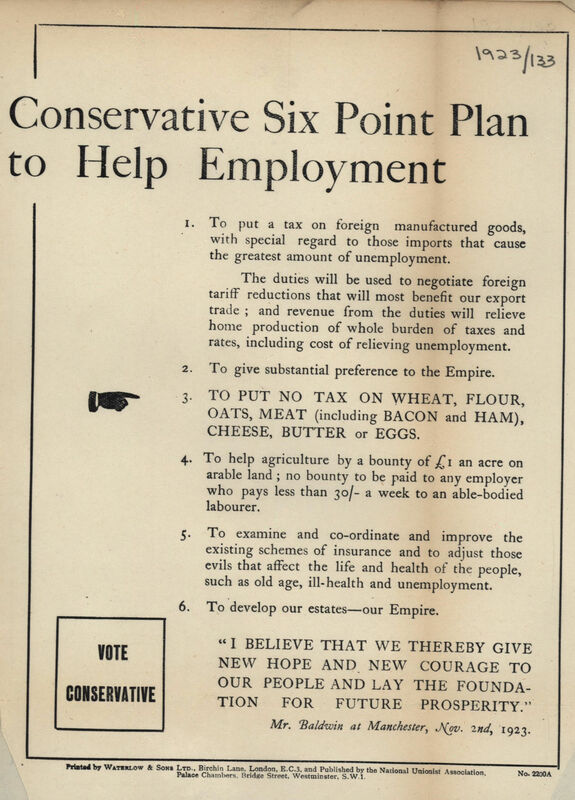 Barely 10 months’ later, with the baggage of Tariff Reform now dropped from the Conservatives’ manifesto, Baldwin led the Conservatives back into government following the landslide victory in the 1924 General Election.